Important Confederate leader and orator. Secessionist. Confederate commissioner to England and France. Confederate Senator. The significant event of his life was his failure to achieve European recognition of the Confederate States. Yancey was born in Warren County, Georgia on August 10, 1814. He attended Williams College in Massachusetts and studied law in Sparta, Georgia. He moved to Alabama at the age of twenty-two and was admitted to the bar there. He became a cotton planter, then a newspaper editor. 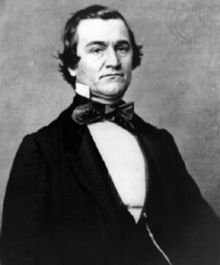 He resumed the practice of law in 1839, served in both branches of the Alabama Legislature, and was elected to the U.S. Congress in 1845. Yancey was a delegate to three Democratic National Conventions - those of 1848, 1856 and 1860. Yancey, like Jefferson Davis, was a proponent of the extension of slavery to the new territories acquired by the Treaty of Guadalupe Hidalgo (which ended the Mexican War in 1848 and set borders between the two nations). He was also a strong opponent of the compromise measures of 1850, a result of which was California as a free state. Other territories were to decide the slavery issue at the time of achieving statehood. Yancey wrote a letter in June 1858, which was finally published in 1860. It recommended the organization of "committees of safety" in all the cotton states to "fire the southern heart," and ultimately to precipitate those states into revolution against the Union. In 1859, Yancey urged the calling of a convention by the state of Alabama, in the event of the election of the Republican candidate for president in 1860. At the Democratic convention of 1860, he and other southern extremists withdrew. He was a member of the State constitutional convention, which convened in Montgomery, Alabama on January 7, 1861. On 14 January, that convention passed the Alabama ordinance of secession, of which Yancey was the primary author. Yancey was appointed chairman of the commission sent to Europe in 1861 to present the Confederate cause to the Governments of England and France, a critical mission which was to be unsuccessful. The failure of Yancey's commission to secure European recognition of and assistance to the Confederate States made the long-term survival of the young nation almost impossible. He was elected to the first Confederate States Senate on February 21, 1862. As a Senator, he successfully blocked the creation of a Confederate Supreme Court on states' rights grounds. He was a member of the Confederate Senate at Richmond until the time of his death. He died of kidney disease at his plantation home, near Montgomery, Alabama on July 26, 1863, and was buried in Oakwood Cemetery.